The difficulty of living now on this side of sickness and surgery, has been well…living. I know that sounds crazy and messed up. But there it is. In sickness or trial of any kind, there’s an intensity to life. A laser sharp focus. No matter how yucky the circumstance may be, there’s nevertheless a funneling of all our faculties to get well, to get through it, figure out how to get to the other side of it, etc. And when we do, the exquisiteness of being on “the other side” (healthy, or pain free) gives way to daily living. This everyday mundane almost imperceptibly scatters dust on our single-minded focus. We begin to use the familiar words “busy”, “scattered”, over-committed” and quite likely we are. We may feel dull, fuzzy-headed, lacking purpose. Re-entering the flow of life after having gone on an adventure (however difficult and painful it may have been) can be disorienting. It might be likened to returning from the battle field. “OK, now what? !” is the question that haunts you , especially when the adventure changed you in some way shape or form. “How do I now live?” is a question worth exploring especially if you want to honor what you have learned and experienced, and not forget the intensity and bits of truth you received while in the trenches. There is a hefty amount of verbiage these days that calls us to GRAND living. Living large, seeking adventure, playing big, rising strong, radical living, big magic, finding your passion, defying small, do what lights you up, don’t waste your life. Please, do not hear me wrong on this. I have found and continue to find encouragement in the discussions within these topics. Yet the overall timbre to these calls to arms leaves me a bit perplexed and flat. Is there room in these manifestos for living an ordinary life? For finding beauty and adventure while playing small? For rising from the rubble of difficulty still weak and uncertain? For discovering magic in scrubbing toilets? For being enabled to live your life, just as it is now, right where it is now, with a sense that here, right here, is where I can find beauty and light. Is there a place for radically living your life as it is now without having to sell everything and live in a tent? Is there a way to actually live the humdrum, everyday, same ole same ole in such a way that imbues it with joy, light, and love? Could we, instead of being called to go do something big and radical so that we won’t “waste our lives”, could we actually live the life we’ve got, the day in and day out, the daily struggles and numbing normalcies with an eye toward beauty? Right here. Right Now. That’s a bit of magic I could go for!! Join in the discussion in the comment section if you like. 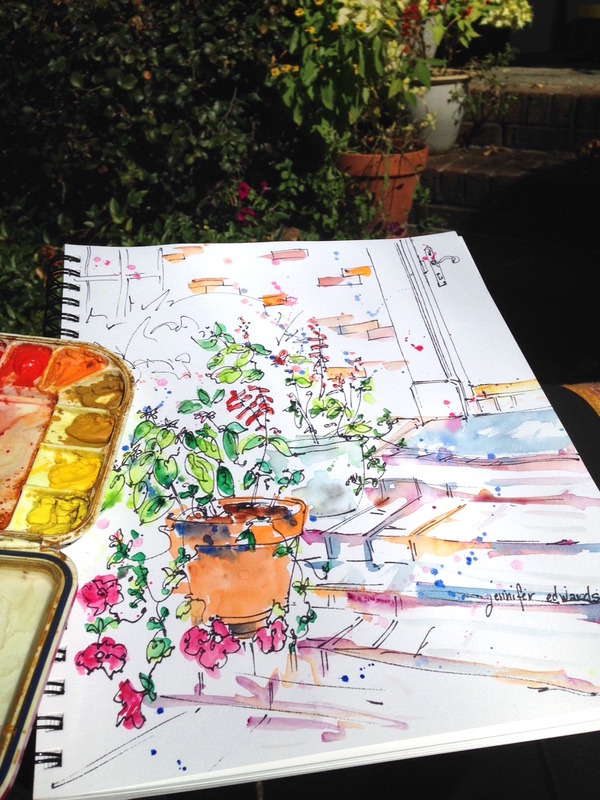 The first drawing is of the waning flower pots on the front steps of our home. I often need go no further than my front door to find beauty. But I have to be reminded of this. Every Day. 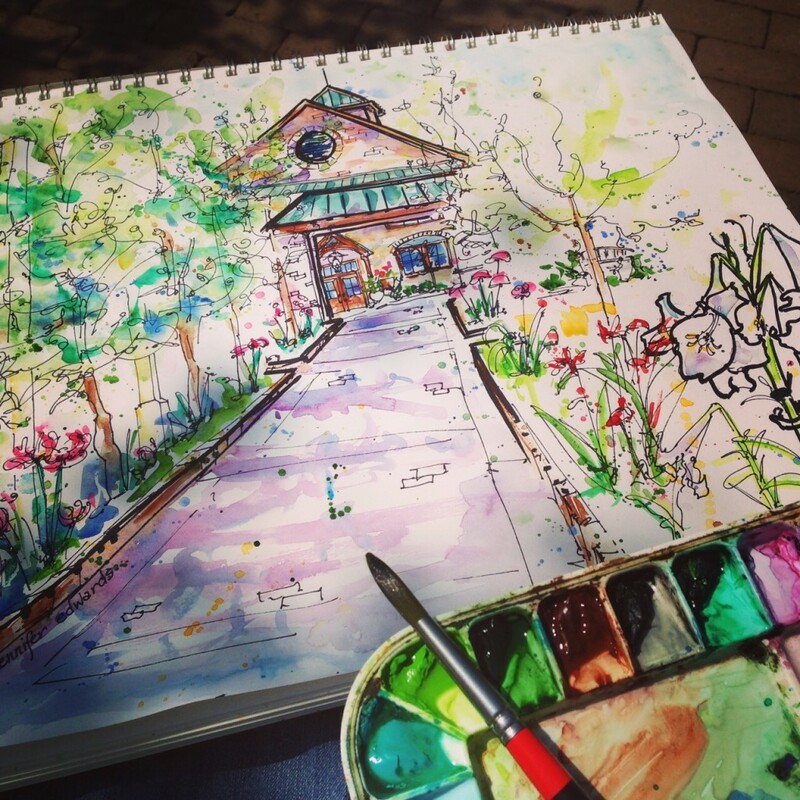 The second drawing is of the Ciener Botanical Gardens here in my small town of Kernersville, NC. Again…a bit of Giverny right here where I live. Dear Jennifer, your writing today really struck a chord with me. I am in that exact place right now myself. I did not have illness, but both my parents died this year. I’m finally beginning to feel my old self again, and I’ve said to my self, “now what”. Thank you for verbalizing what I’ve been thinking. I’m going to pass on your blog to a friend who just lost her husband. Thank you for your courageous words today. Oh Sharon. I am so so sorry to hear of your losing both your parents. I will be remembering you in my thoughts and prayers as you ask the “now what” question. Many blessings and comfort to you in this time of grieving. And thank you, THANK YOU for taking the time to share your life with me here. With much affection, Jennifer. Wow…how true. I’ve come across your blog via a link on Facebook. It’s so wonderful to find someone who understands how I felt. After my cancer treatment (especially as a young person at 26) I felt that there was this massive expectation placed on me to do something amazing with my life. And actually all I wanted to do was live a ‘normal’ life but live it well. It has taken me a long time to do this but now, 5 years on, I think I generally manage to find that quiet appreciation in daily living. Every so often it all gets a bit overwhelming again and I have to step outside and take a deep breath. Good luck on your own journey. Thank you for continuing to share your life so that many people may reflect on theirs. I would call that “living big”. In my mundane life of getting my girls to school, scrubbing a toliet, prepping for dinner and then waiting around for a client that didn’t show up, my “living big” came when I did my daily devotional practice and felt the connection to my body and spirit. I think it is when I look outside of myself for happiness that living my small life isn’t enough. My daily life of struggles and questions of “how to do this” are easier when I remember to pray every day and acknowledge gratitude for the many blessings I have. Caring for my mother in her last year was like having my own sickness and mission. When she died I was “out of a job” and had no idea how to fill the hours with “normal life”. Everything changes us; we are never the same person after such a life event. Thank you for your courage in sharing your journey and your words that so beautifully describe the inexplicable. Linda, you are so right here…it forever changes us. I so appreciate you sharing this with me here. And thank you for your kind words! May you have a beautiful, creative day! I cannot imagine, Karin, the pain and difficulty of these days of caring for your parents. I hope that your continuing to make beautiful art (as I see on Instagram;) is sustaining you, along with the comfort and strength of Christ. Taking the low place is definitely where we see His hand at work. It is so so hard. But good too. Blessings to you! Yes!! There must be a way to do this. I appreciated the reminder, though, that after intensity there is an unexpected limbo. This will set me up for a more successful November! I often wish we could visit in person, but I find joy in your writing and art. Thank you Robin for your visit here on the blog! I do hope your November will be full of beautiful moments you can capture creatively somehow. From your email address, I might gather that music is one of those creative places for you. May there be music in your heart every day! Jennifer, I am so sorry for your health issues, and am so pleased to hear you are “on the other side” of these challenges. I find the impact of illness to be particularly frustrating, both as a patient and a health care provider. Much of the language “we” use about illness and “recovery” implies that the person with the health challenge “is to blame” for the condition or ” would be better if they just….” tried harder, had more faith, etc. I also find a lot of pressure to “be back to normal” or “be cured”, when these are often not realistic goals. I’ve spent my life as a person with pretty serious chronic illnesses, but I generally have thought of myself as healthy. I have “flares” of my illnesses, and have developed more conditions over time. I will never “be back to normal”,. I can’t hope to be my “previous normal”, and I’ll never be the “normal” that most people experience. This is not my fault, it is merely my reality. My goal is always to be the best I can be in my current situation, and I encourage my patients to strive for the same. Most days I can face the world with energy and joy, and I pass for “notmal”. But some days getting out of bed is the most I can hope for. Those bad days are a reality, and those days I find my happiness in simple things. Soft sheets, the ability to control the environment around me, foods that nourish me and taste good, having a wonderful support system, etc. I still want to be excellent and an achiever. But what I want most is to be a person who will remembered as a person who was a good friend and who lived and loved to the best of her ability. Jennifer, I thank you for your thoughtful posts and sharing the beauty and power of your art. I wish you a life where you can feel that your “normal” is good enough, and that you always feel how extraordinary and amazing you are. Living in the present is the best gift we can give ourselves. I’m reminded of it everyday with homeschooling my son who is 7. Thank you. So true, so true! All the best to you as you teach and guide your son! And thank you for taking the time to comment here. Have a beautiful, creative day Mary Ann! Your drawings are really beautiful! I enjoyed reading this post – thinking at first that you were going to advocate ‘living it big’ or that sort of thing. I’m so glad to hear someone say that we can live what some people might consider a small, unadventurous, unproductive life but in reality we are really living. Thanks so much Gillian for commenting here and for your kind words about my drawings. I have felt for many years now that the real work of life is to see the beauty in the everyday whether it is pretty or painful. Thanks for joining in the conversation!